The main differences in a button down shirt. Once you determine the cut--relaxed, slim, regular there are only a few other details. These are the type of collar--with a band or without, the length of sleeve--short or long, the sleeve placket on a long sleeve, and whether the front placket is cut on or sewn on. The Ethan has a sewn on front placket. This is great when wanting to add detailing or if for plain fabrics. 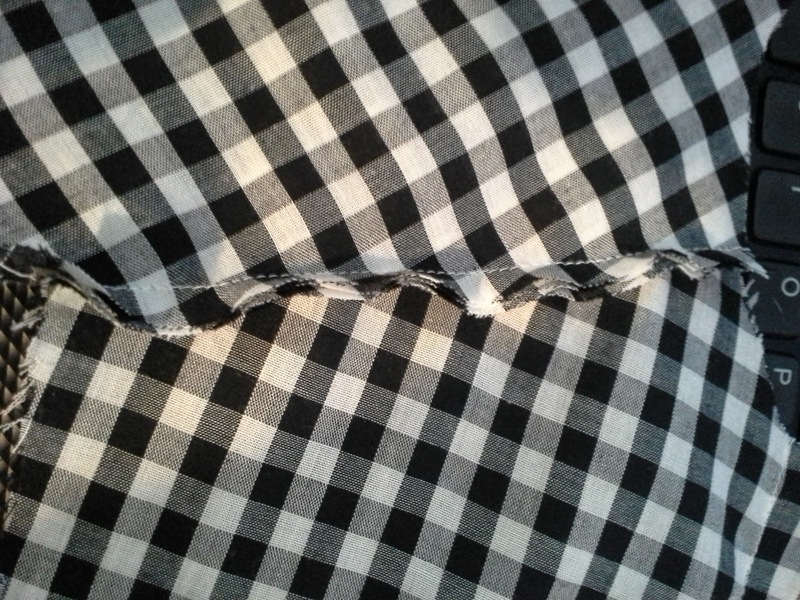 Unfortunately, this time I am working with gingham. If I had thought ahead, I would have extended the center front so that it could have just been turned and sewn. But, I didn't. 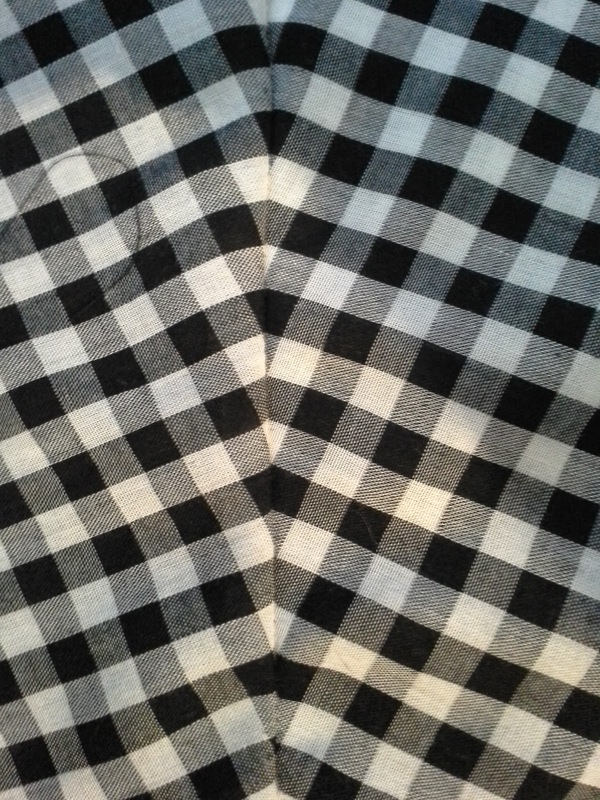 I could also have cut the front placket on the bias and had them diagonal like I usually do. But, nope. I didn't. but I will need to rip it out. What I did do, is leave myself an extra 1/4 inch, or row of checks on each side of the pattern piece to give some wiggle room for matching. 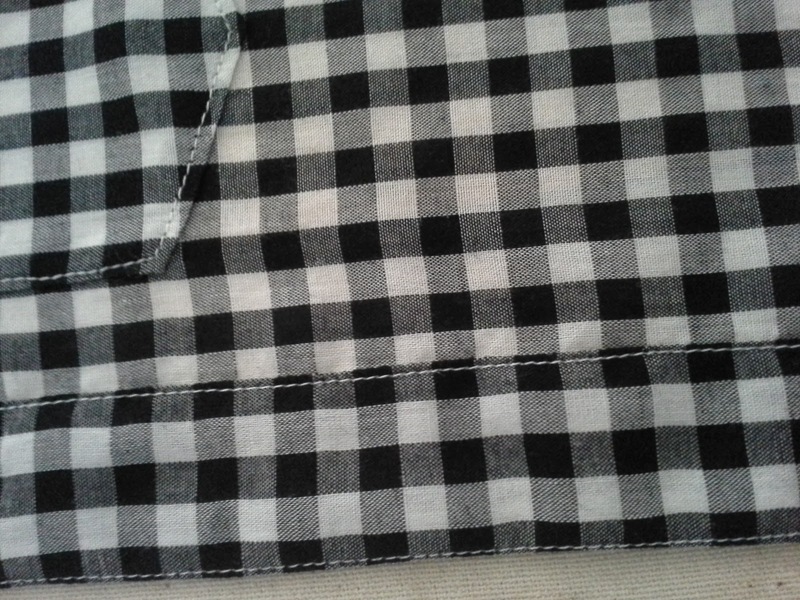 I matched everything up, then pressed under the edges of the placket, placed it and topstitched the placket. I then pressed, trimmed, turned and started pinning. It didn't match the way I had wanted. I was off by a check and a half. I decided I needed to make some iced tea. Oh, and it was time to pick up the kids from school. When I came back to it, I tried to figure out how to do this now that I had trimmed the fabric. I considered recutting the front, but I didn't want to redo that front pocket. No wonder it looked good on the outside, I messed up. I get to rip both sides out. I realized I could do make it work, but I would have only 1/8 allowance. I stitched so close to the edge that I am surprised it is actually not off the edge, but it worked! I then was able to go about my business of pressing and pinning and top stitching. Outside--yoke, collar band and collar. Decent match for somewhere no one will see. Now on to the yoke. On the shoulder seams of a man's (or boy's) shirt, the seam is enclosed. This is done by pinning the right sides of the front to the right side layer of the yoke, then rolling the front and back together and pinning the inside of the yoke to the wrong side of the front. When it is done, it is sooooo coooool. This time, I didn't get it right. The worst part is that I had matched the checks so well. I considered leaving it. But I just couldn't. So, I started picking some stitches. and pin it to the the collar, while matching the checks. 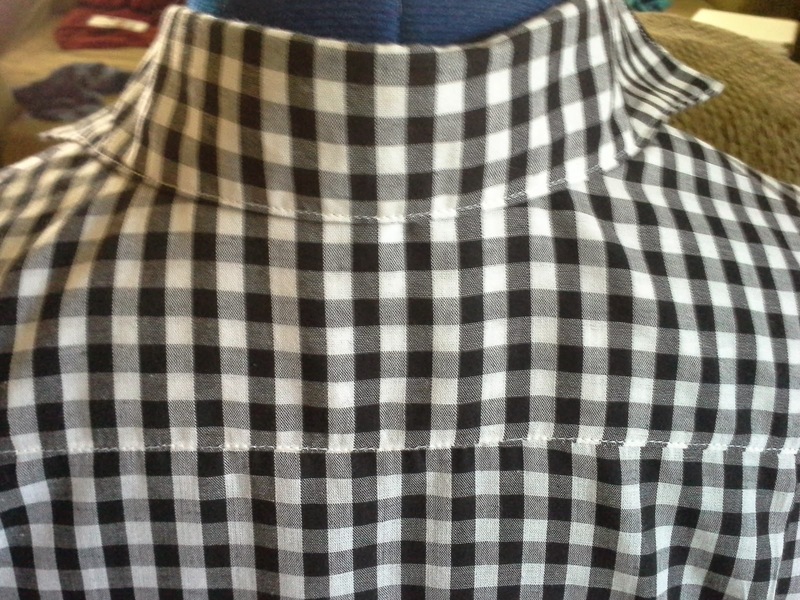 Finally, I did it right and was able to move on to attaching the collar bands and the collar. Because I had planned ahead and lined up the fabric while cutting, matching was not difficult. 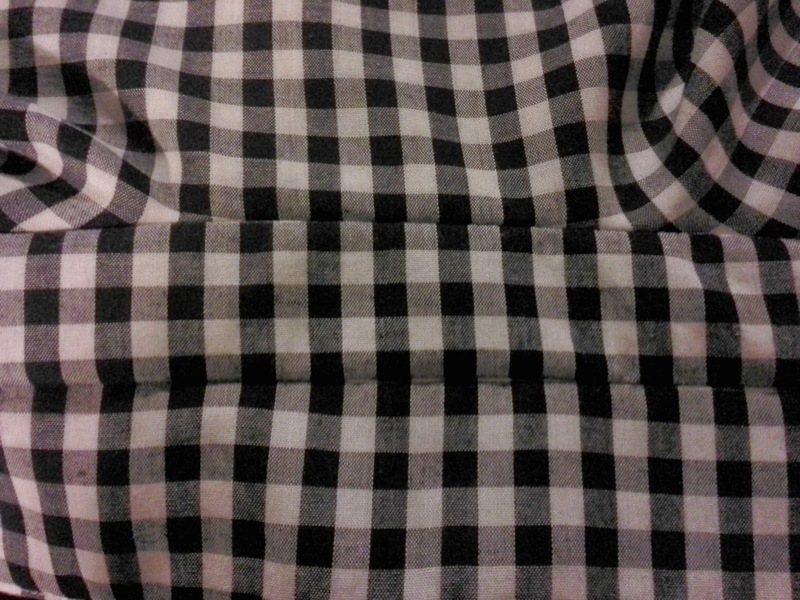 However, I did have some problems that I didn't see until I top stitched the collar band. 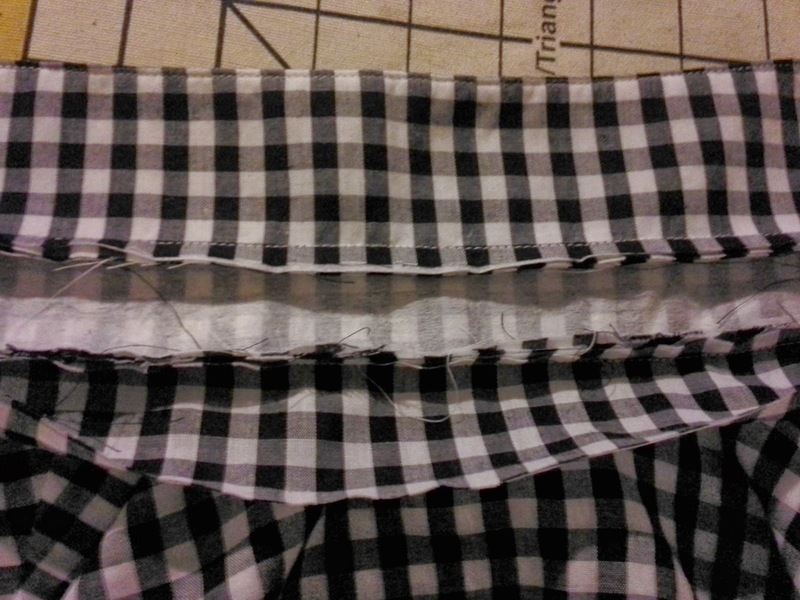 I had matched up the two layers when I pinned and then sewed. However, it was evident with some bunching and poofing only visible under the collar if the collar was up. I managed to not get a photo of this. Mr. Toad said it was fine for that particular child. I left it and went to bed. This morning I decided to pick the stitches. reason, the right side of this picture is showing it off. Why don't I use larger stitches? It would make unsewing so much easier. I finally was able to start again and realized that I hadn't matched the two collar bands exactly. I had to ignore the checks and pin it. This time it worked. I don't have much left. Just inserting the sleeve, sewing the sides, hemming, buttonholes and buttons. Seriously, not much. But I have even less energy. Wow...good for you for persevering!! I hope you finish well. Thanks, Vanessa. I think perseverance is one of the character traits we learn through sewing. Matching seams! WOW. One of the hardest things I have done and you have made it look effortless. Great job. PS. I have selected your blog for the Liebster Award. It is given to new bloggers that have less than 500 followers. The rules are simple if you choose to accept this nomination. Thank the person that nominated you, answer the questions that have been set forth for you, nominate 5 other bloggers that you believe deserve this award and give them a set of questions as well. You can use the questions that you were sent or you can create your own list. You can find your questions on my blog along with the award itself. Double thanks to you! That is very flattering. Thanks, Vicki. Gingham is usually inexpensive. If you make something for a kid, it can give you a chance to practice. Plus, they usually don't notice if it doesn't match. Also, they outgrow things quickly so you don't need to look at something mismatched for long.